The flood prevention works at Clay’s Lake are being carried out by Mackley working as part of Team Van Oord on behalf of the Environment Agency. 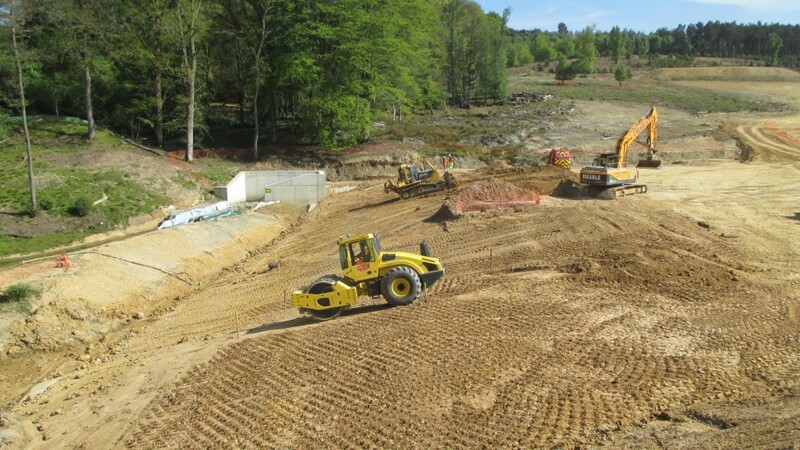 The works comprise the removal of an existing dam which is being replaced with a larger dam. This will increase the lake’s capacity from 10,000 cubic metres to nearly 400,000 cubic metres, thereby reducing the risk of flood to more than 280 homes in the area, and to Gatwick Airport. The scheme has received three different site visits in the past 12 months from delegations representing IOSH, the Environment Agency and the University of Brighton. On 7 June a delegation of senior managers from the Environment Agency, which included the Agency’s new Chief Executive, Sir James Bevan, enjoyed an ‘informative’ visit to the scheme. Two months earlier (April 2016), around 40 members of the IOSH (Institution of Occupational Safety and Health) South Downs Branch experienced an ‘enjoyable and interesting’ visit to Clays Lake. And late last year a group of students from the University of Brighton gained ‘real life’ civil engineering experience though a visit to the West Sussex site.